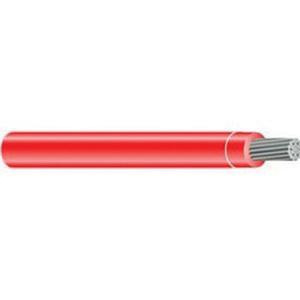 500-KCMIL Aluminum THHN cable in red color, has PVC insulation that offers protection against electrical threats. This cable has nylon jacket for resistance against moisture, heat and sunlight. This cable has voltage rating of 600-Volts. It withstands temperature rating of 90 deg C in dry conditions and 75 deg C in wet conditions. This 1000-ft cable comes in reel and is suitable for wet/dry locations. Cable is RoHS compliant, UL/cUL listed, CSA certified and meets Federal specification.